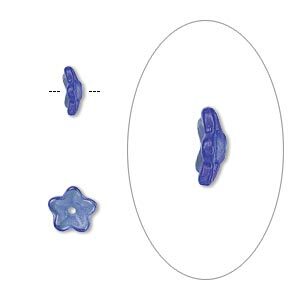 Bead cap, Czech pressed glass, light cobalt, 7x3mm flower, fits 5-7mm bead. Sold per pkg of 50. Transparent pressed glass beads imported from the Czech Republic. Size and shape may vary slightly and color may vary from dye lot to dye lot. Items are made with solid color glass, which means the base color of the glass is saturated throughout the object and will not fade or rub off over time. 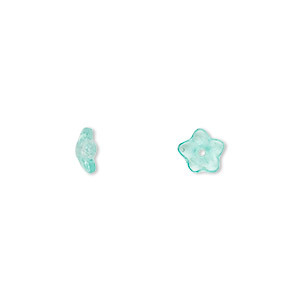 Bead cap, Czech pressed glass, light aqua, 7x3mm flower, fits 5-7mm bead. Sold per pkg of 50. Bead cap, Czech pressed glass, cobalt, 8x3mm flower, fits 6-8mm bead. Sold per pkg of 50. Bead cap, Czech pressed glass, opaque white, 7x3mm flower, fits 5-7mm bead. Sold per pkg of 50. Bead cap, Czech pressed glass, olivine, 7x3mm flower, fits 5-7mm bead. Sold per pkg of 50. Bead cap, Czech pressed glass, jet, 7x3mm flower, fits 5-7mm bead. Sold per pkg of 50. Bead cap, Czech pressed glass, opaque white, 8x3mm flower fits 6-8mm bead. Sold per pkg of 50. Bead cap, Czech pressed glass, clear vitrail, 7x3mm flower, fits 5-7mm bead. Sold per pkg of 50. Bead cap, Czech pressed glass, emerald green, 8x3mm flower, fits 6-8mm bead. Sold per pkg of 50. Bead cap, Czech pressed glass, ruby red, 8x3mm flower, fits 6-8mm bead. Sold per pkg of 50. Bead cap, Czech pressed glass, yellow, 7x3mm flower, fits 5-7mm bead. Sold per pkg of 50.